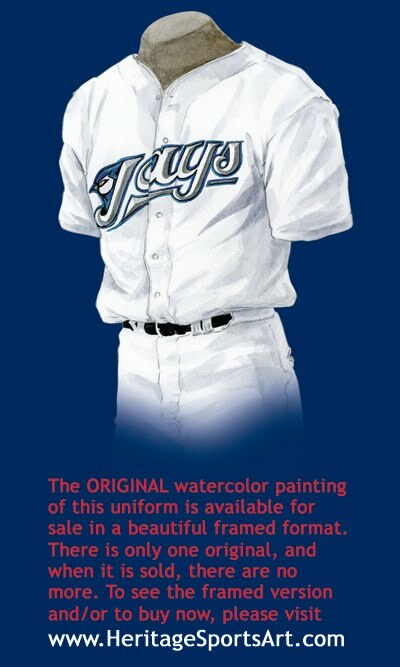 Please click on the evolution of the Blue Jays uniform poster above for a close-up version of the poster. The descriptions below give you some insight and background about the uniforms and/or eras depicted in the poster. The Toronto Blue Jays were almost the Giants. In 1976 the San Francisco Giants almost moved to Toronto, until local buyers rescued the team and kept them in San Francisco. Toronto was awarded a team in ’76 anyway, as the American League expanded to 14 teams. 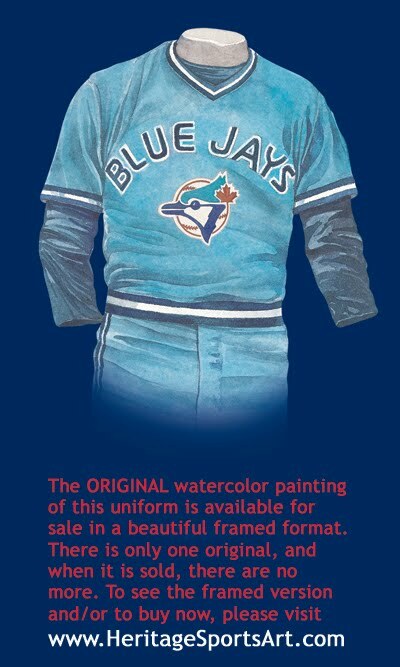 The Jays first home opener on April 7th 1977 was a snowy affair against the Chicago White Sox. Even with snow covering the field of Exhibition Stadium, the Jays took the opener 9-5. The Jays would finish in last place in the American League East with a record of 54-107 this season, (and for the next five seasons!). The first home uniform for the Jays was a double-knit style that most major league teams succumbed to during the 70’s and early 80’s. 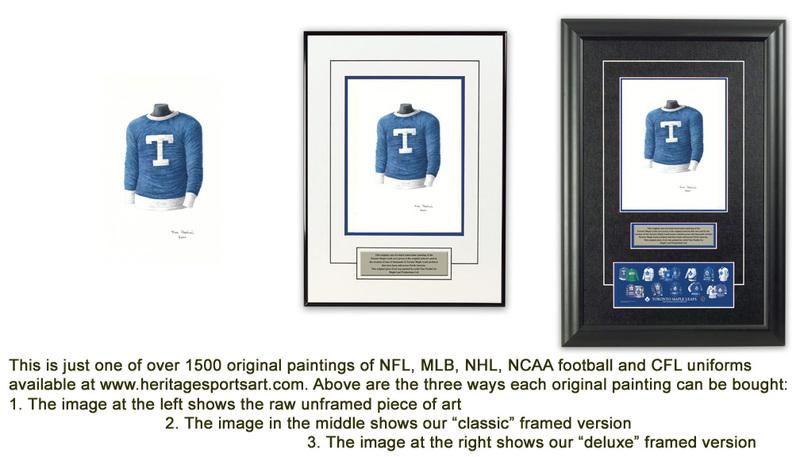 It was a pullover style, made of stretchy, synthetic material. The pants were called “Sans-a-Belt” because the elasticized waistline eliminated the need for a belt. The “BLUE JAYS” lettering was unique to the Jays, and are the only team to use it. The logo of the Blue Jay head was designed by a Toronto company, Savage Sloan Ltd. This road uniform is almost the same as the home uniform we saw the year before. The blue uniform had “TORONTO” in dark blue on the front. Adding Rico Carty and John Mayberry to the Jays lineup sure couldn’t hurt. Mayberry hit 22 homers this season and Carty added 20 of his own. The Jays still finished in last place with a record of 59-102, but the future looked bright. Next season would see shortstop Alfredo Griffin win the Rookie of the Year honors, (he shared the award with Minnesota Twins John Castino) the only time a Blue Jay would win the award. 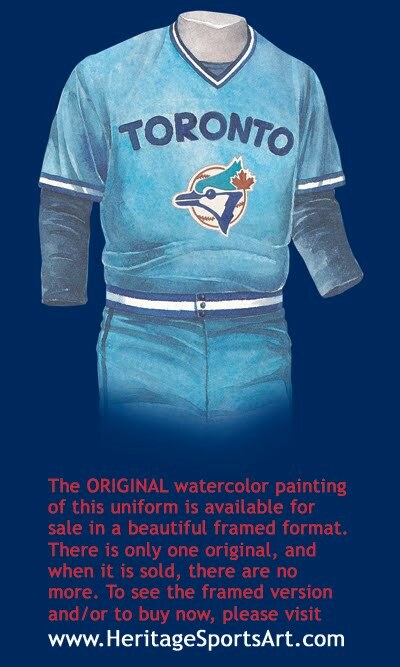 As we see on this road uniform, the Jays have switched from using “TORONTO” on their away jersey’s to “BLUE JAYS”, which they would wear on both home and away uniforms. This is the first year they would do this, and it would last until 1989. In the year of the players strike, the season is split into two halves. It didn’t help the Jays. They won only 37 times this season, losing 69 games, and were 23½ games out of first. This was the first year that we would see an All-Star Outfield with George Bell, Jesse Barfield and Lloyd Moseby. A winning team was starting to come together. 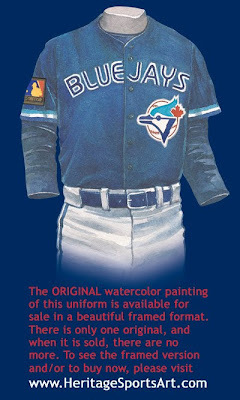 This home uniform is exactly the same as their inaugural season, (thank goodness the team wasn’t) with the double-knit pullover style, made of stretchy, synthetic material and the “Sans-a-Belt” pants with the elasticized waistline for a belt. The “BLUE JAYS” lettering on the front was still unique to the Jays and the blue jay head was still right in the middle of the jersey. After crawling out of last place for the first time in 1983, the Jays came in second the following year. In 1985 they topped the Yankees by two games finishing atop the American League East standings at 99-62. Pitcher Dave Stieb led the AL in ERA at 2.48, as manager Bobby Cox led his team to 99 wins, and was honored as Manager of the Year. They played George Brett and his Kansas City Royals for the AL Pennant. The Jays went up 3 games to 1 in the series, and were looking at their first pennant in team history. The Royals had other plans. They came back to win the next three in a row, ending the Jays hopes of a chance at the World Series in ‘85. 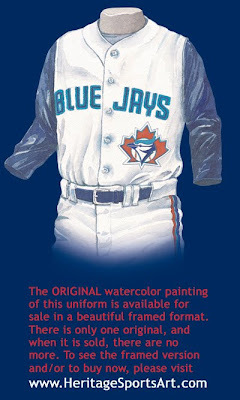 The Jays finally made some changes to their uniforms in 1989, as we see on this ’91 home uniform. They have lost the pull over style in favor of a button down jersey with the Blue Jay logo to the one side. They have also added a “real” belt and banished the elasticized belt. The Jays hosted the All-Star game this year and showed this with the patch on the left sleeve. The Jays moved out of the odd confines of Exhibition Stadium in early June 1989, and into the modern day wonder called SkyDome. Their new home had a retractable roof so there wouldn’t be any more “snow days” like the home opener in ’77, yet the fans could still enjoy Toronto’s hot summer weather when the dome was open. It had all the luxuries you could want at a ball game, including a massive TV screen called the “Jumbotron”, a restaurant over looking center field, and a hotel attached to the stadium with rooms that look onto the field. The Jays had several new faces on the team this season including Joe Carter, Roberto Alomar and Devon White, who all contributed in the team finishing in first place in the AL East with a record of 91-71. They faced the Minnesota Twins for the pennant, but fell to the eventual World Series Champs, 4 games to 1. 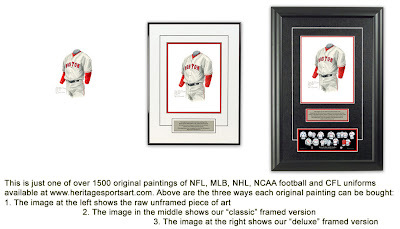 The road jersey we see on this championship uniform is the same as the year before, with the addition of the World Series patch on the right sleeve. Teams began wearing these patches in the World Series in the early 90’s. Let the fun begin! They Jays make more additions to the team with ace pitchers Jack Morris and David Cone, while adding the experience of Dave Winfield, and the return of Alfredo Griffin. By the end of the season the Jays had won their second straight AL East crown finishing 96-66, and went on to face the Oakland A’s for the Pennant. Behind the play of Roberto Alomar, the Jays took their first American League pennant 4 games to 2. The stage was now set for the first World Series to be played outside America. The Atlanta Braves took the first game of the series, but then Toronto took over. They won three straight to take a stranglehold on the championship. After losing game five, the Jays came back in game six with one thing in mind, victory. The Jays led 2-1 going into the bottom of the 9th only to have the Braves tie it up, and send the game to extra innings. In the top of the 11th, the Jays scored 2 runs to take the lead 4-2. In the bottom half of the inning the Braves scored a run to come within 1, but with two out Atlanta’s Kenny Lofton tried to surprise the Jays with a bunt. He was thrown out at first, giving the Toronto Blue Jays its first World Series Championship and the first “North of the Border”. 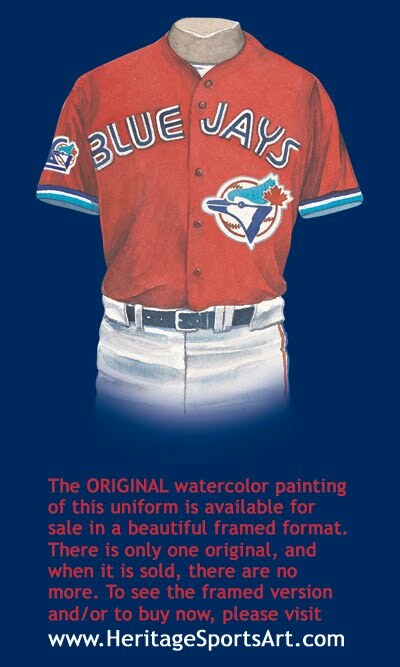 This home uniform hasn’t changed much since the first time we saw it in 1991. They have a World Series patch on the right sleeve as the team defended their championship this season. After winning a World Series Championship, what can you do to top it? How about winning two in a row! Once again the Jays added more talent to the line up, most notably, ace pitcher Dave Stewart, clutch hitter Paul Molitor, and stolen base record holder Rickey Henderson. For the third straight year the Jays took the AL East over the Yankees, with a record of 95 wins and 67 losses. They faced the Chicago White Sox for the pennant and took it for the second straight year in six games. The Fall Classic awaited the Jays, with only the Philadelphia Phillies standing in their way, (note: in 1944 & 1945 the Phillies were actually called the Blue Jays). The blue birds went up 2 games to 1 in a high scoring Series so far. Game 4 would be no different. Going into the 8th, Philly was up 14-9. Closer Mitch Williams came into the game looking to shut down any attempts at a Jay comeback. As the inning ended and Williams walked back to the dugout, the Jays had scored 6 runs and win the game 15-14 and up 3 games to 1 in the Series. The next game saw the Phillies Curt Schilling pitch a complete game 5 hit shutout, just what the Phillies needed. On to game six in Toronto. The Jays went up 5-1 early on, only to have the Phillies score 5 of there own in the 7th to take the lead 6-5. Mitch Williams comes on once again to close things out in the bottom of the 9th. Rickey Henderson and Paul Molitor both get on base, as Joe Carter steps up to the plate for one of the most memorable moments in World Series history. He drives a Williams pitch to left for a dramatic three run homer, giving the Jays their second straight championship. Carter’s home run is only the second Series ending homer in history (Bill Mazeroski of the Pirates also turned the trick in 1960 in Game 7 vs the Yankees). Paul Molitor was named the Series MVP with a .500 batting average, 2 home runs, 2 doubles, 2 triples and 8 RBI. 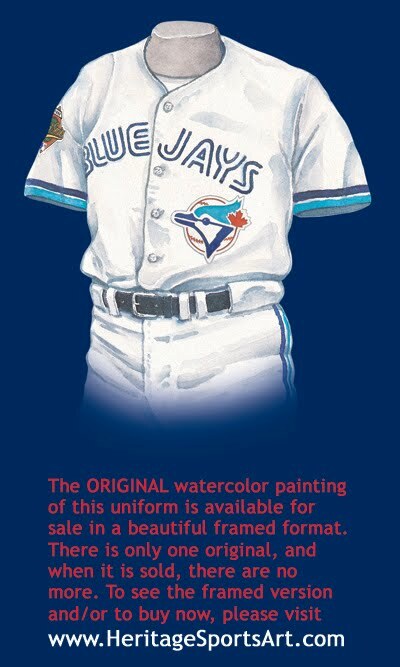 The Blue Jays wore a couple of road jerseys this season. The blue one we show here is the first all blue top we have seen on the poster since the 1981 model, (thank goodness it isn’t the light blue anymore!). The look is the same as previous years, with the addition of the commemorative patch on the right sleeve in honor of the 125th year of professional baseball. 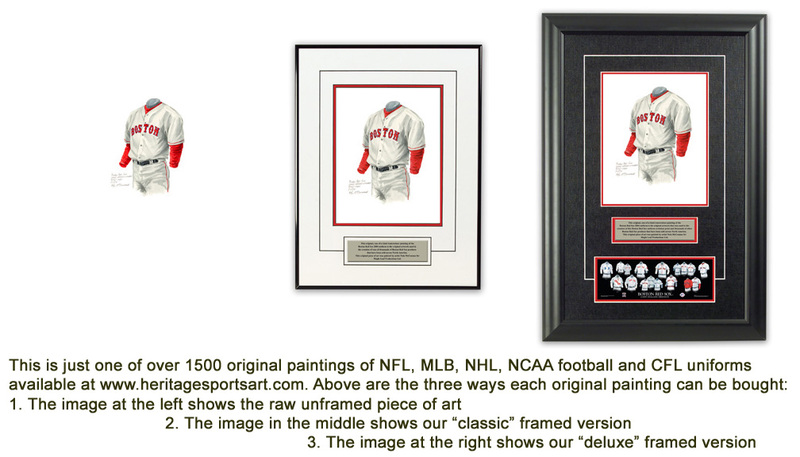 The patch has the Major League Baseball logo and “125th Anniversary” on it, and celebrates the Cincinnati Red Stockings 1869 team that was the first openly professional team and went 65-0 in a nationwide barnstorming season. In this, the year of professional baseball’s 125th Anniversary, there would be no World Series for the first time in 90 years, when a player lockout in August 1994 put an end to the season. The Jays were sitting in 3rd place in the AL East with a 55-60 record, 16 games back. In the National League the Jays Canadian counterparts, the Montreal Expos were leading the Majors in wins, and some said this would be their year for a championship. Oh what might have been for Canada’s other team… What a shame. On July 1st, Canada Day, the Jays began wearing this red jersey when they played a game at home. On the back, the player’s names were taken off, and replaced with “CANADA”. The patch on the right sleeve commemorates the 20th anniversary of the ball club. The team has its first Cy Young winner this season as Pat Hentgen is given the award after going 20-10 for the season, while teammate Juan Guzman led the AL in lowest ERA with 2.93. The blue birds start to rebuild the team after so many years of winning. They finish this season in 4th place, 18 games out of first with a record of 74-88. The new look Blue Jays. 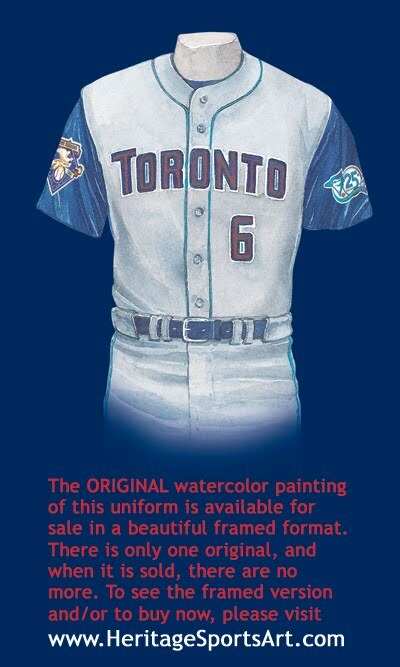 As we see on this road uniform, changes were made in 1997, and first shown on the poster this year. The logo is new, and has been moved from the front of the jersey to the sleeve, as the player’s numbers are on the front for the first time. 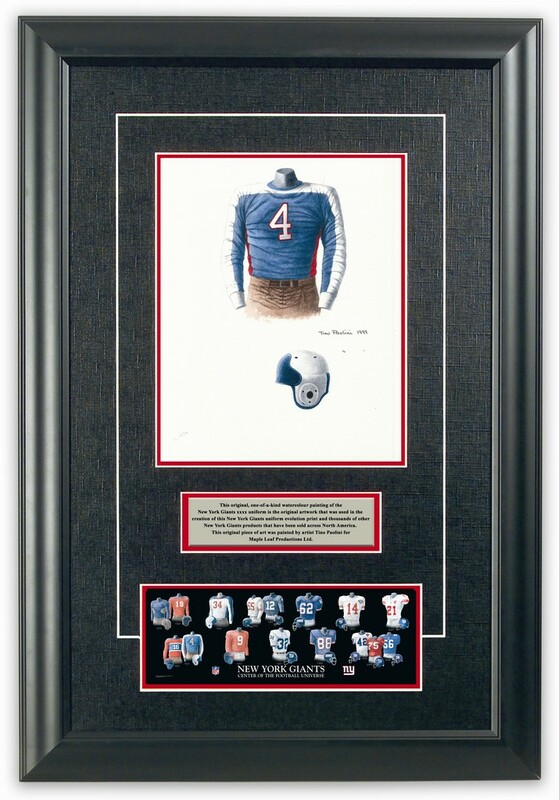 Uniform numbers first made their appearance on the front of a uniform in 1952 - the Brooklyn Dodgers were the first team to wear uniform numbers on the front of their jersey. The Braves followed suit in 1953, and the Reds joined in beginning in 1956. The 1916 Cleveland Indians actually wore a uniform number on their sleeve, but it wasn’t until the ’52 Dodgers that the number made it to the front. The lettering has been altered, and a red stripe has been added to the dark blue and light blue stripes down the leg. In the last year of the 90’s, a decade that began so well for the Jays, they finally begin to have a competitive ball club once again. With the emergence of heavy hitting Carlos Delgado, the Blue Jays stay in the hunt for a Wild Card spot this season, until they hit a slump in August. They end up in third place, behind the Yankees and Red Sox, with a record of 84-78. 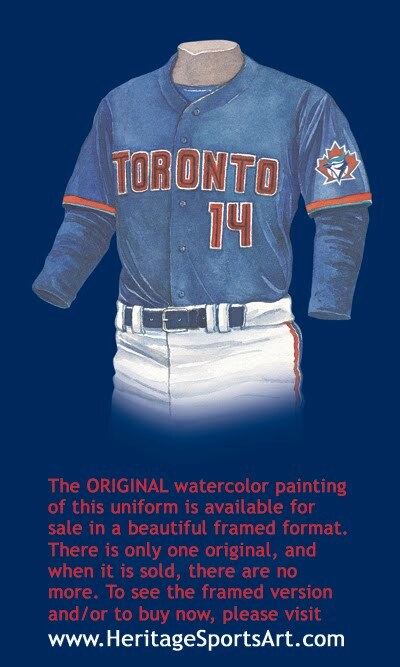 For the new millennium, the Jays have made a change to their home jerseys. They have gone to the vest style, which was made popular in the 60’s. 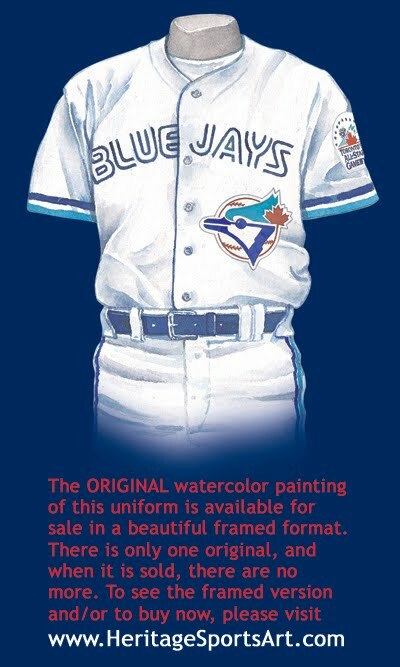 The Blue Jay patch is now back on the front of the jersey, replacing the player’s numbers (this is only for the home vest). The Jays have another encouraging season, finishing in third place once again with 83 wins and 79 losses, but only 4½ games behind the Yankees. David Wells leads the Jays pitching staff with 20 wins, (tying him for the American League lead). The blue birds sluggers keep on slugging, leading the AL in home runs with 244. 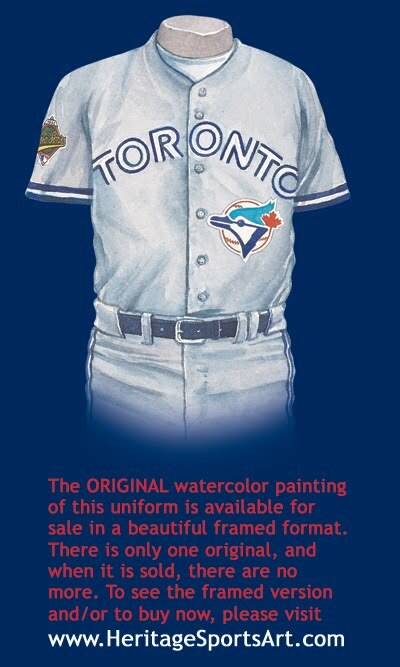 As we see on this road, vested uniform, this is the first time the Jays have had a jersey where there is no Blue Jay logo on the front or the sleeve. The only Blue Jay emblem we see is on the patch on the left sleeve, which commemorates the Jays 25th season. 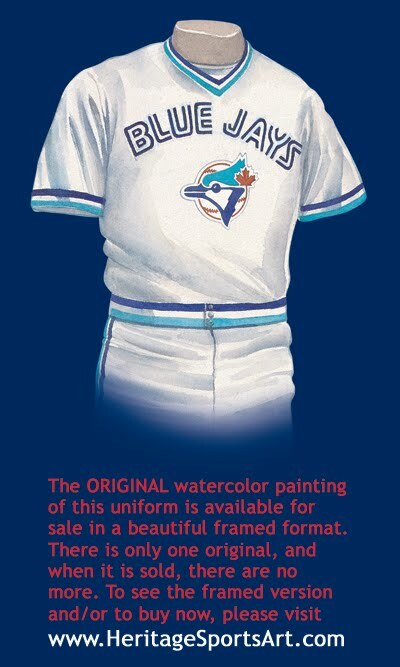 There are two Blue Jay logos on it, the original one from 1977, and the new Blue Jay. Written on a banner at the bottom is; “A Summer Tradition Since 1977”. The patch on the right sleeve is for the celebration of the American League’s 100th Season Anniversary. The Jays hire a brand new manager for the 2001 season in Buck Martinez, the Jays former catcher. Much was made of Martinez’s move from the broadcast booth to the field without any coaching history. With Martinez at the helm, the Jays finish third in the AL East, with a 80-82 record, behind the Yankees and Red Sox. Toronto is led by Carlos Delgado who hit 39 home runs and 102 RBI, while outfielder Jose Cruz Jr. stepped up to hit 34 homers and drive in 88 RBI. The Blue Jays entered the 2004 season with high hopes, or at least higher hopes than the previous couple seasons. But the club got off to a terrible start winning just 7 games in the month of April, including getting swept at home on opening weekend at the hands of the Detroit Tigers. To make things worse the team was beset by injuries to some of their important veterans. This would prove to be too much for their nucleus of young players and the team never recovered. At 67-94, the 2004 Blue Jays finished 19 games worse than they did in 2003, and injuries played a large part. Carlos Delgado, Vernon Wells, Roy Halladay and Frank Catalanotto all missed at least a month, sinking the Jays out of third place for the first time in seven seasons. Pat Hetgen, the 1996 Cy Young winner, returned to the team hoping to revitalize his career. Unfortunately, he would end up retiring halfway through the season with a miserable 2-9 record and a 6.95 ERA. The Jays finished last in the AL East for the first time since Tampa Bay joined the league - you have to go all the way back to 1980 to find a Toronto team that lost more games than the 2004 Jays. All of this would eventually lead to the firing of Manager Carlos Tosca who was replaced by John Gibbons for the final 6 weeks of the season. Under Gibbons the Jays would not fair much better going 20-30. They ended the season in last place with a terrible record of 67-94. The good news: Rookies P Dave Bush, RF Alex Rios and P Jason Frasor proved they were legitimate major leaguers. 2B Orlando Hudson emerged as one of the best at his position, CF Vernon Wells won a Gold Glove and LHP Ted Lilly became an All-Star. As the Jays toiled in 2004 there were few bright spots as even Carlos Delgado had a disappointing season by his standards knocking in just 99 RBI, as the Jays stellar offence of 2003 could not get going in 2004 finishing 12th of 14 teams in the American League in runs scored and team batting. Meanwhile reigning Cy Young winner Roy Halladay only mustered an 8-8 record while missing 2 months with a tired arm. The Jays team ERA ranked 11th in the 14 team AL. Following the season the Jays began to refocus their efforts allowing Delgado to leave through Free Agency as they tried to focus on their young pitching prospects. They became the lone Canadian team as the Montreal Expos were moved to Washington. 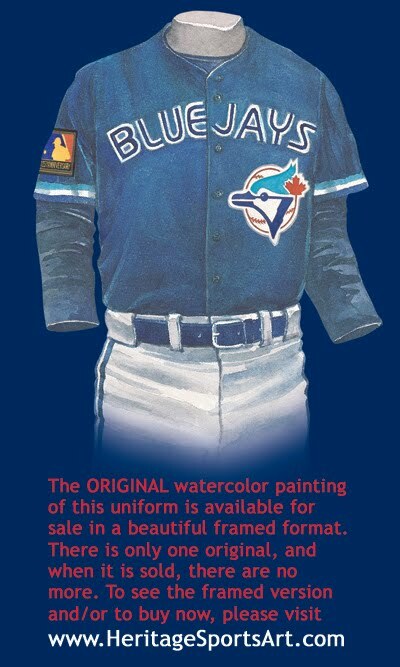 In 2004 the Blue Jays adopted a new look. Gone were the colours normally associated with the team (i.e. royal blue, light blue and red). In are more modern colours: graphite, silver and black. 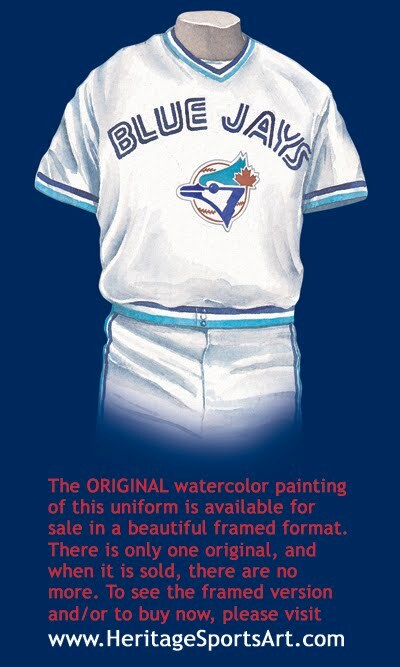 The Team also adopted a new logo, a feisty looking Blue Jay's head coming out of a stylized metallic “J.” The club’s full “Blue Jays” nickname is no longer in use on the uniform; it’s been abbreviated to just “Jays”.